Happy Friday! I hope that everyone had a great week! Today I have some gorgeous cards to share with you from Katie Gehring and Karolyn Loncon. 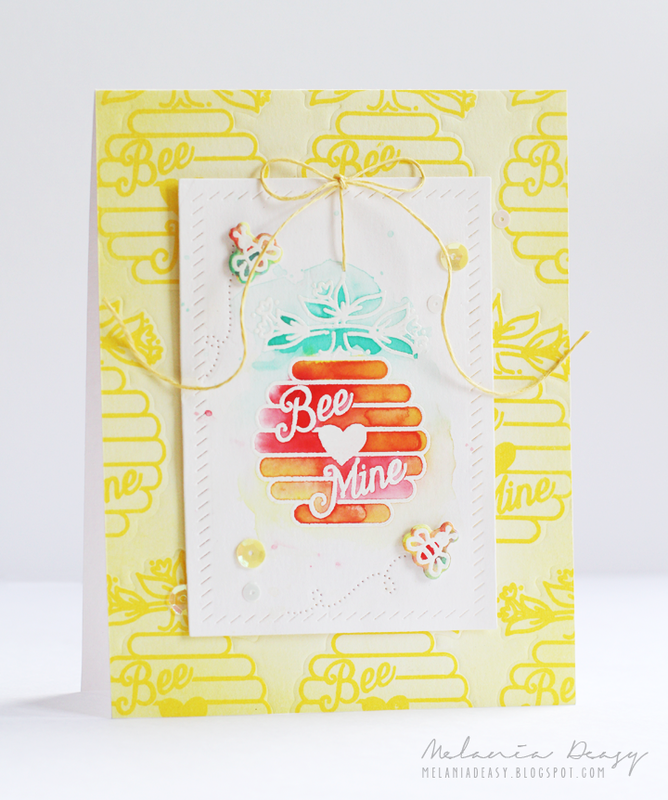 Katie created this first card using our Bee Mine stamps and dies and the Dotted Borders Elle-ments die. I love how she partially die cut the adorable bee hive. It is just so cute! 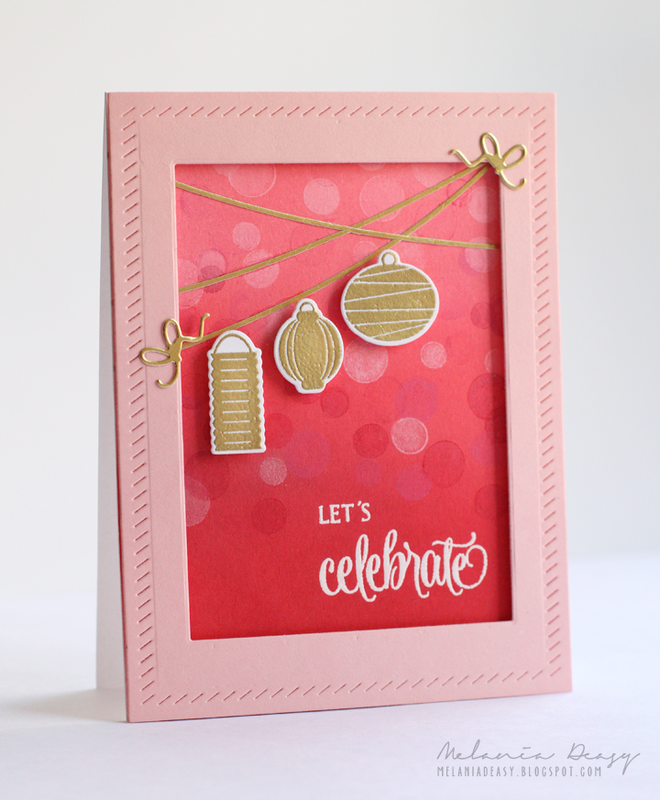 Karolyn used our Berry Good stamp set along with our You're Invited and Dotted Elle-Ments dies to create this next card. I love the rustic feel of it! 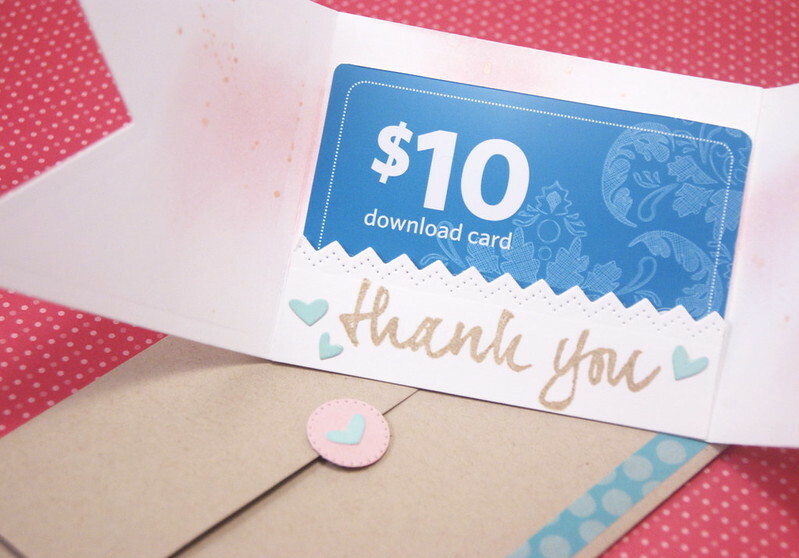 Karolyn used our Berry Good clear stamps again to create a totally different look in this next clean and simple card. I love it! Thanks Karolyn and Katie for sharing with us today! Thank YOU for taking time out of your day to stop by to take a peek. Have a great weekend! Today I have some inspiration from Heather Campbell and JJ Bolton to share with you. 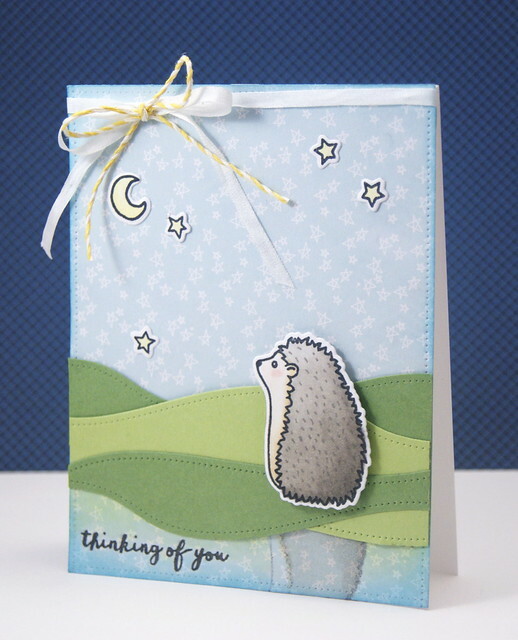 Heather created this first card using our Storybook and You're Invited stamp sets. 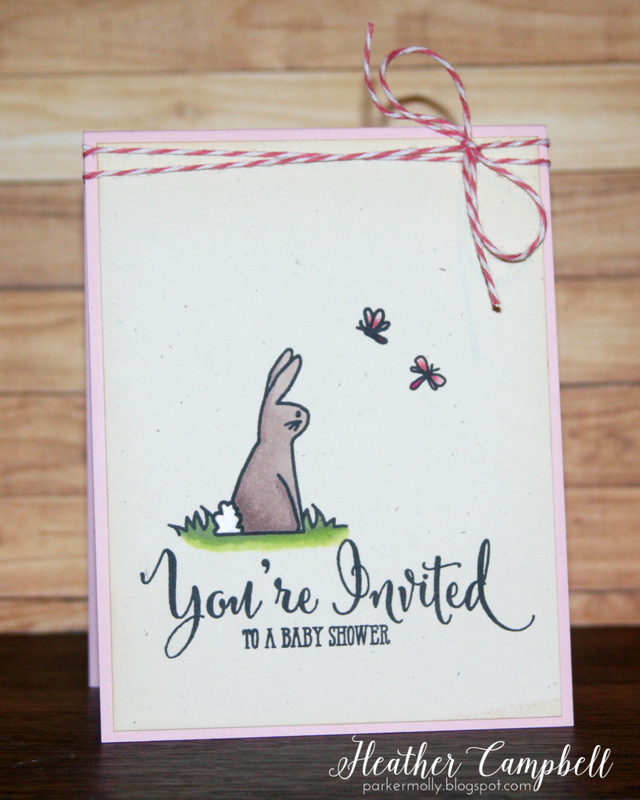 I love this sweet little baby shower invitation. It is too cute! 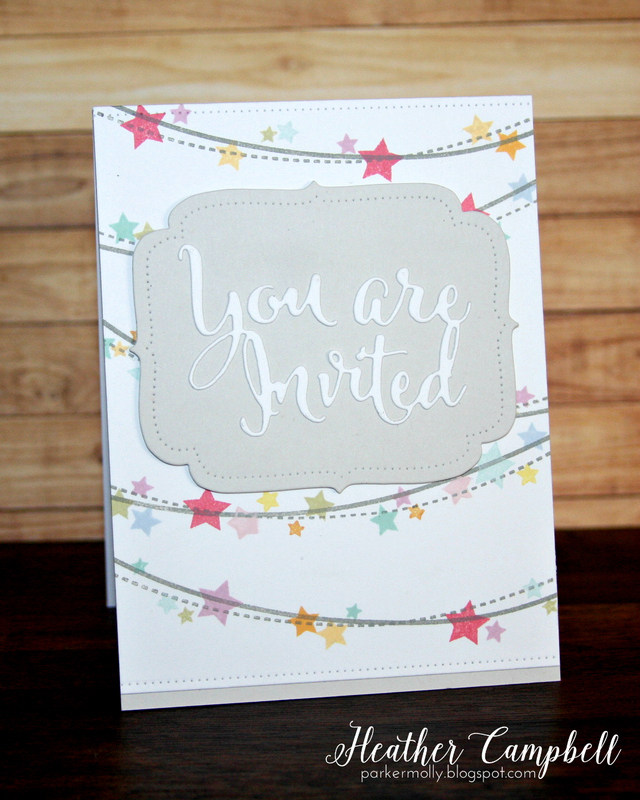 Heather paired our You're Invited stamps and dies with our Bunting stamps and dies in the next invitation. I love the simple look of the string lights over the opening. JJ used our Elle's Alphas stamp set, Embellish It Needle Little Heart dies and our and Aim High dies to create this love themed shaker card. I love her idea of using the alphabet stamps and our Cherry and New Moon ink pads to highlight the I Love You portion of the sentiment. So clever! Thanks JJ & Heather for sharing with us today. We also want to that you for stopping by to take a peek. Have a great day! Hello! I have a fun card to share with you today. 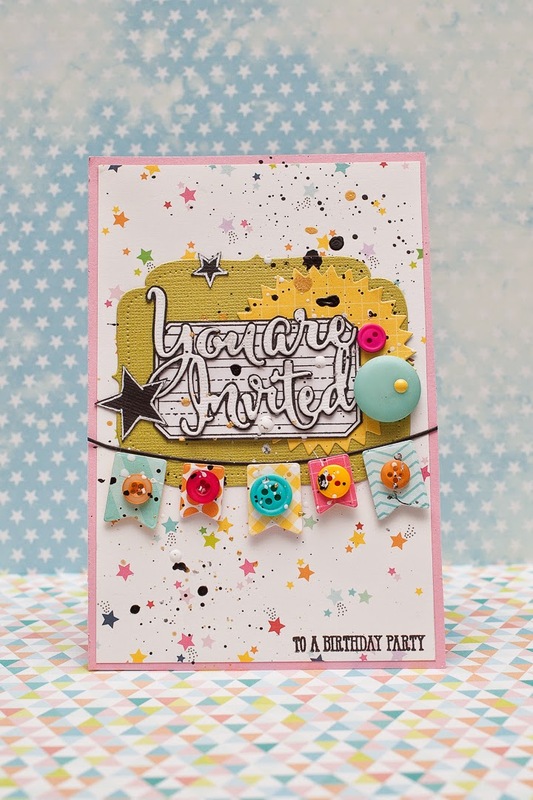 Maska used our Avery Elle Signature dies, You're Invited stamps and dies along with cute star paper from our The Everyday Collection Paper to create this artsy birthday invitation. I love all of the detail and layers! Thank you Maska for sharing it with us! Hello! I have some fabulous inspiration by Chunyuan and Melania to share with you. Chunyuan created this first card using our Berry Good stamp set, Thank You Die, Finished Frames Dies and Mint To Be pigment ink pad. I love the mint and pink color combination. It is so happy! Melania created this next card using our Bunting stamp set and dies and Finished Frames Dies. I love the gold and pink color combination and the bokeh effect she created for the background. It is so lovely! Thank you Melania and Chunyuan for sharing your creations with us. Thank YOU for taking time out of your day to stop by our blog to take a peek. Have a great day! Hello! I hope that everyone had a great weekend. I have two cards to share with you today. 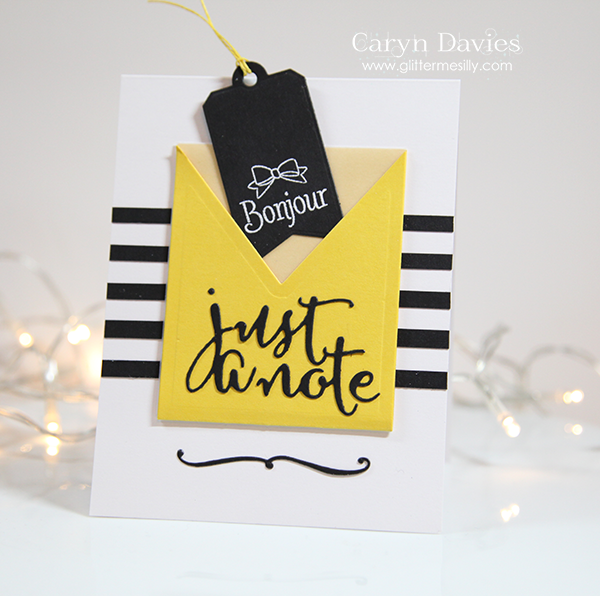 Caryn Davies created this first card using our Just A Note dies, Gift Tags dies and Bonjour clear stamps. 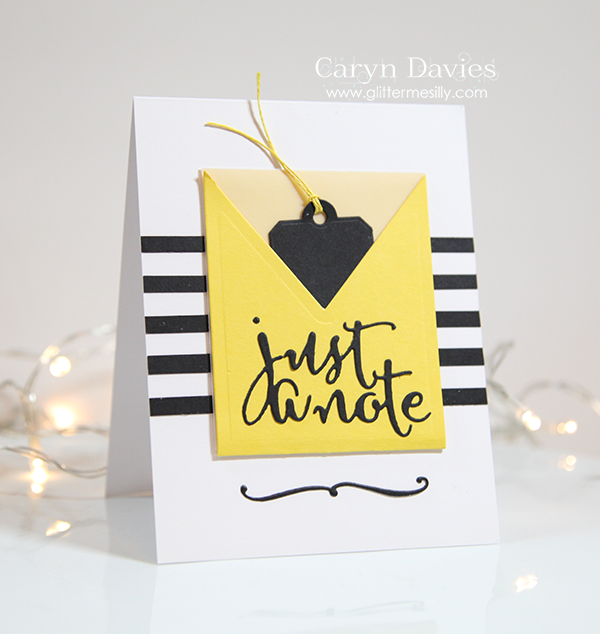 I love the bold color combination that Caryn used! The little tag inside the pocket is just so cute and is a great way to tuck in a greeting! So clever! Yainea used our Dotted Borders dies along with our The Everyday Paper Collection and More Stories clear stamps to created this beautiful card. The reflection of the cute critter is just brilliant! I love little details like this. They add so much interest to a card. Thank you Caryn and Yainea for the fantastic inspiration today! We so appreciate you taking time out of your day to stop by to take a peek. Have a great day! Hello and Happy Friday! I hope everyone had a great week so far! Today I have some fun projects to share with you. 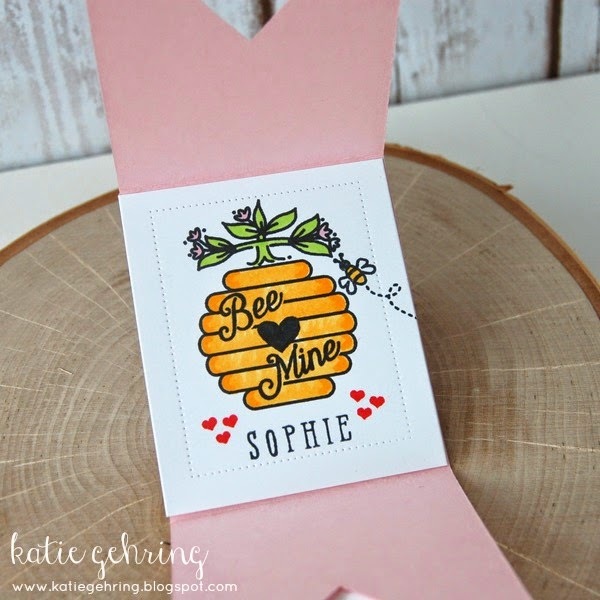 Katie Gehring used our Elle's Alphas, Bee Mine and Lots of Love clear stamp sets and our Just A Note Elle-ments to create classroom Valentines. It is so cute right?! I love it! 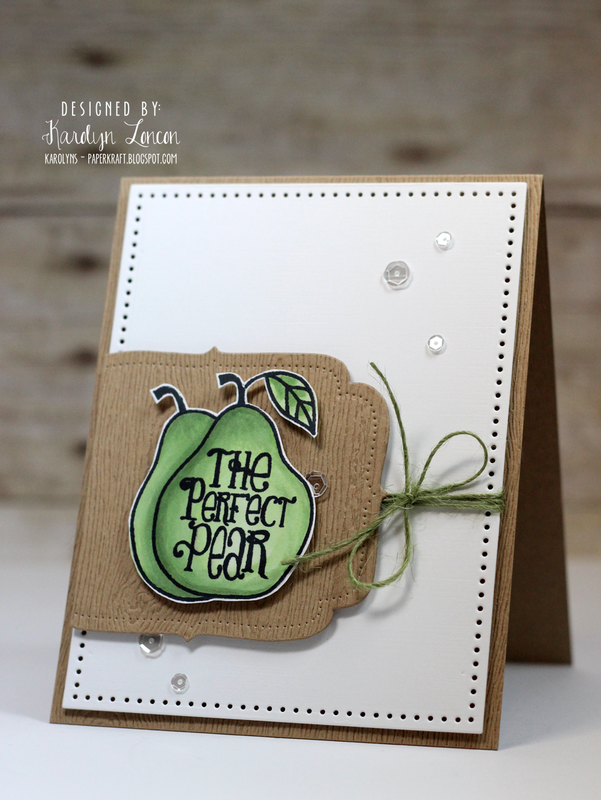 Karolyn Loncon used our Elle's Alphas stamps and Bee Mine stamps and dies to create this cute little gift. 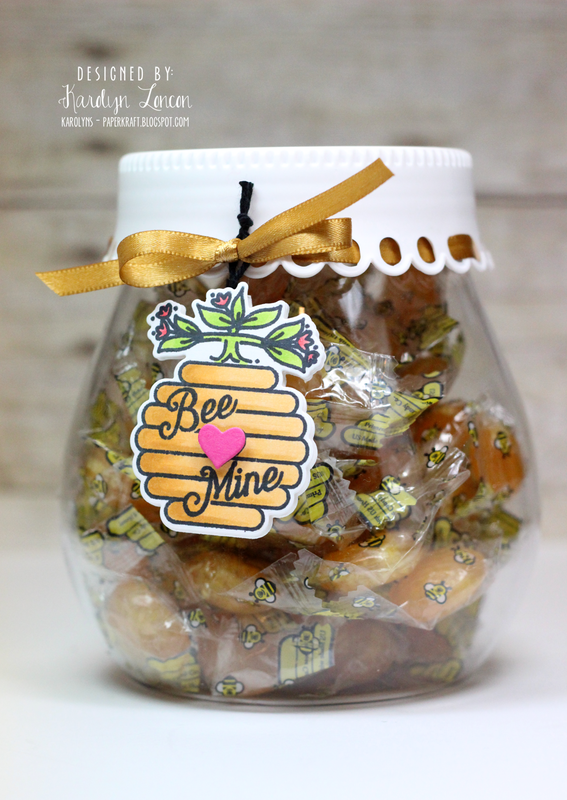 I love the idea of making the bee hive into a tag. Be sure to stop by Karolyn's blog for more details! Hello! 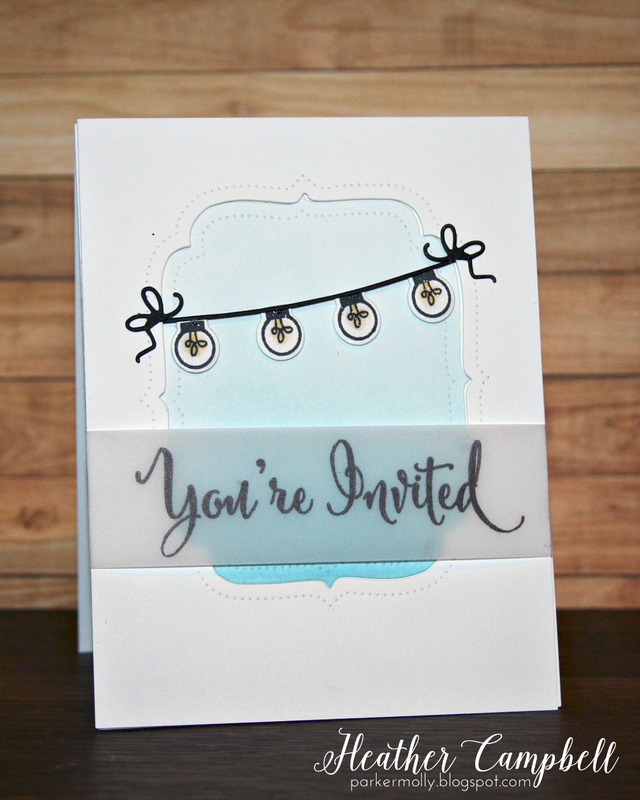 I have two fun invitations to share with you today. 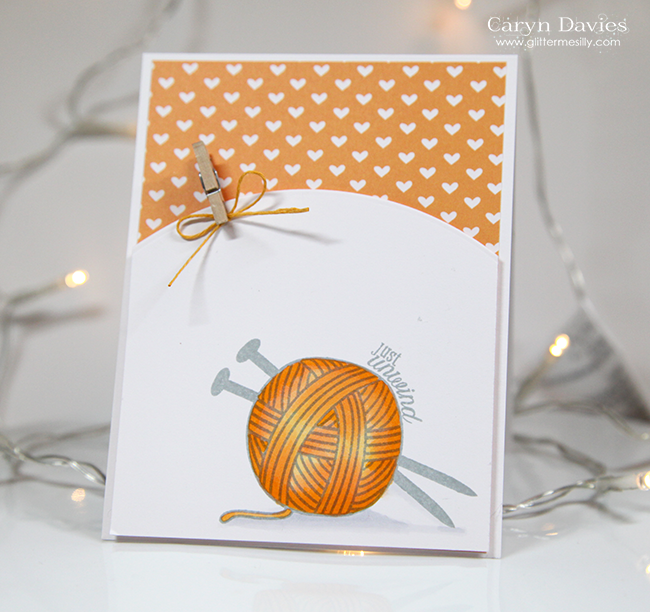 Heather Campbell created this first card using our You're Invited and Dotted Borders dies and Bunting Stamp set. Heather shows how well these sets work together. This is so festive. 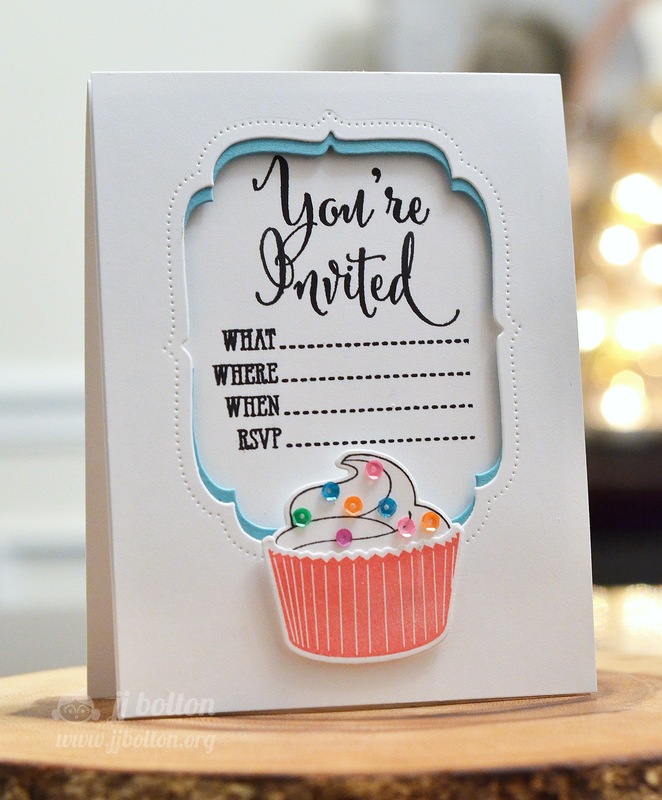 JJ Bolton created this next invitation using our Cupcakes stamps and dies and You're Invited Stamp and die. I love the way JJ has the aquamarine card stock peeking out of the frame. It is such a fun touch. That sequin cupcake looks fantastic at the bottom. I love it! 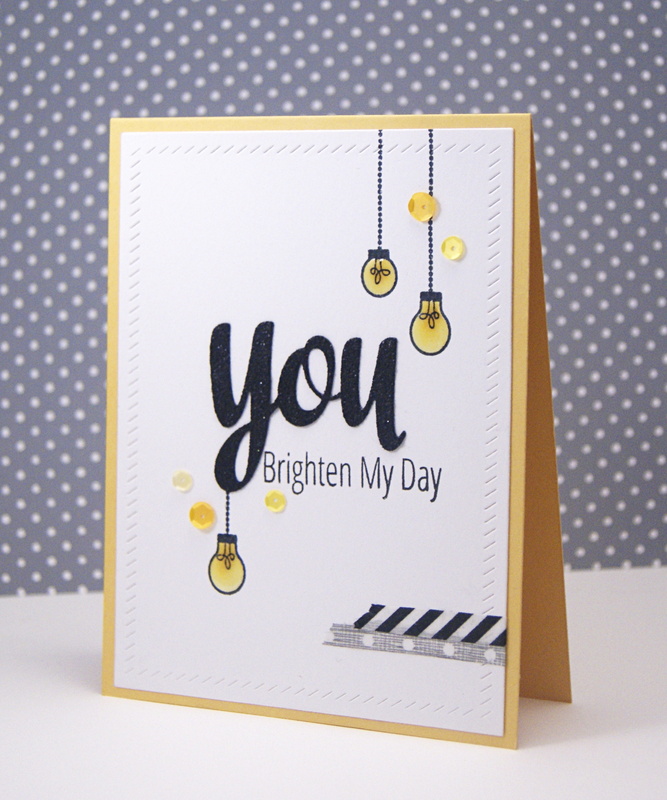 Today I have a fun card by Maska to share with you. 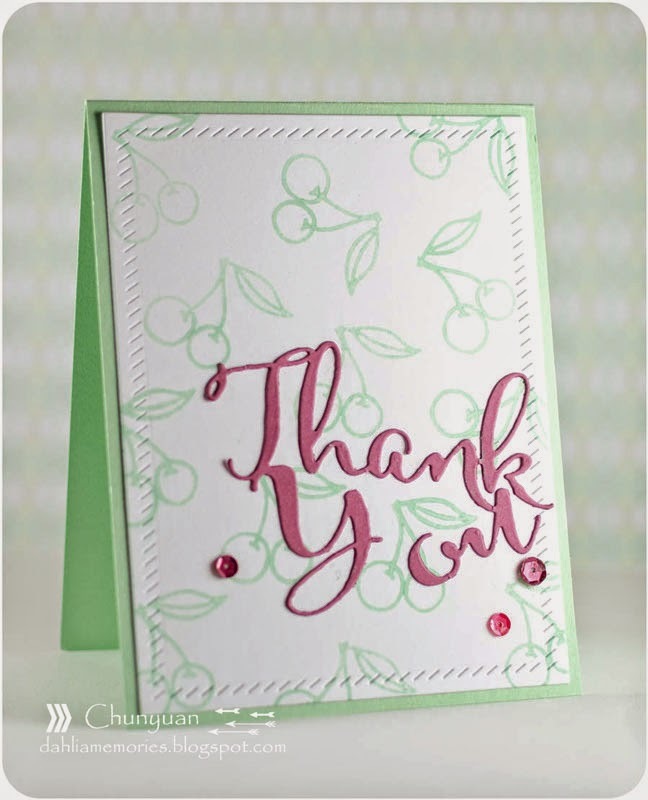 She created it using our new Thank You die and Elle's Alphas stamps. I love the detail and how artsy it looks! It is just fabulous! Hello! I have some amazing inspiration to share with you today. 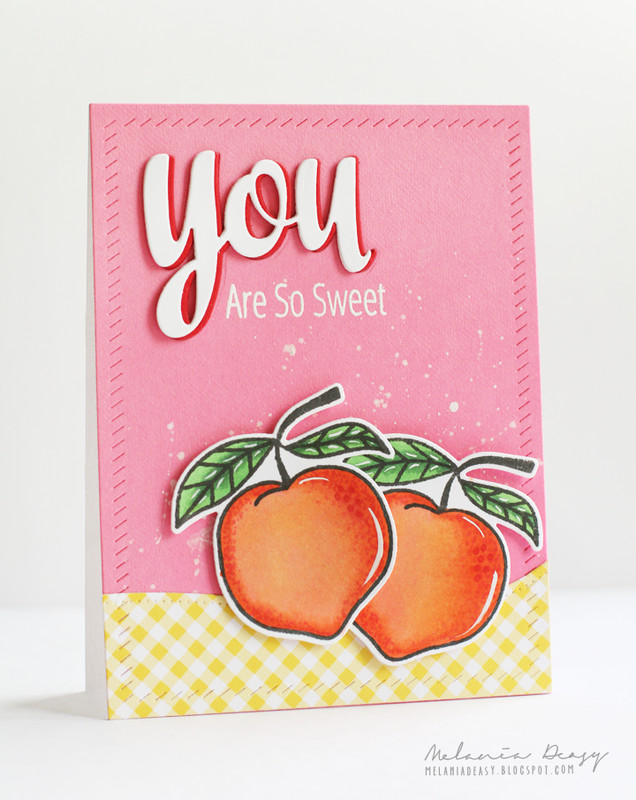 Chunyuan Wu created these first two cards using our new Dotted Borders die set. 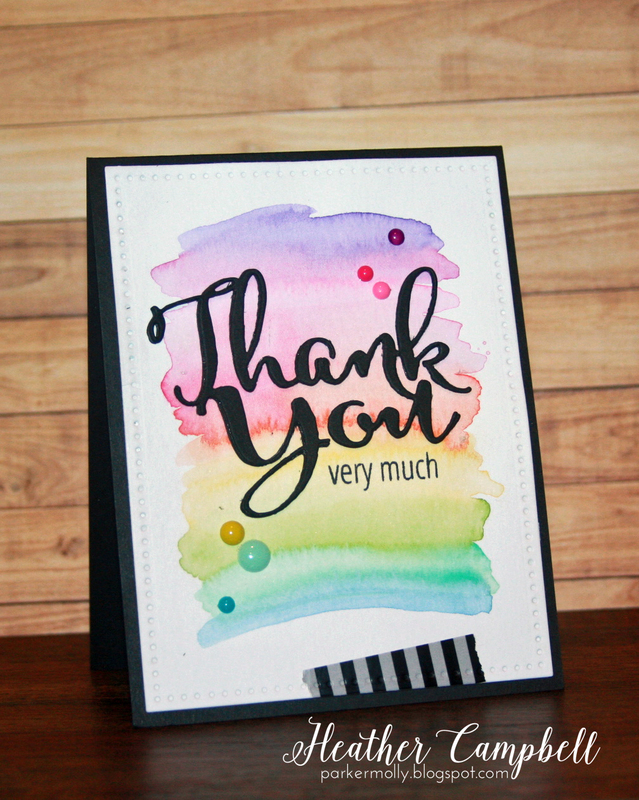 I love how she used the tiny circle that is included in the set along with our Many Thanks stamp set. They go so well together! 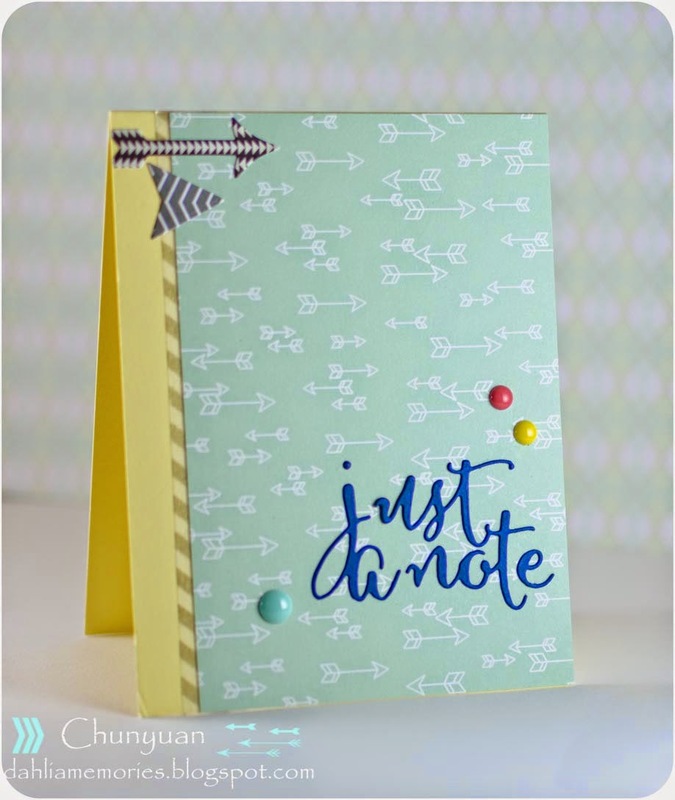 Chunyuan used our Dotted Borders and Simply Said You dies along with our Many Thanks stamp set and Everyday Collection Paper Pad in this next card. I just love the combination! Melania Deasy created this next card using our Berry Good and Simply Said You stamps, Everyday Collection Patterned Paper,Simply Said You Dies, Dotted Borders Dies and Finished Frames dies. Isn't it gorgeous?!? Those peaches look good enough to eat! lol! Happy Monday! I hope that everyone had a great weekend! Today I have two great projects to share with you. 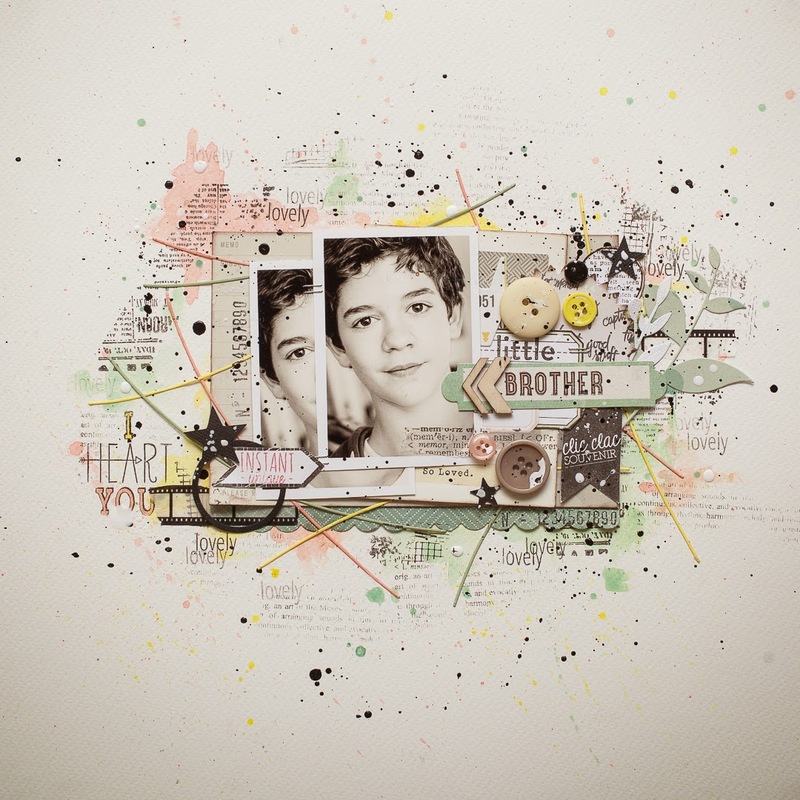 Caryn Davies created this first project using our Simply said You stamps and dies. 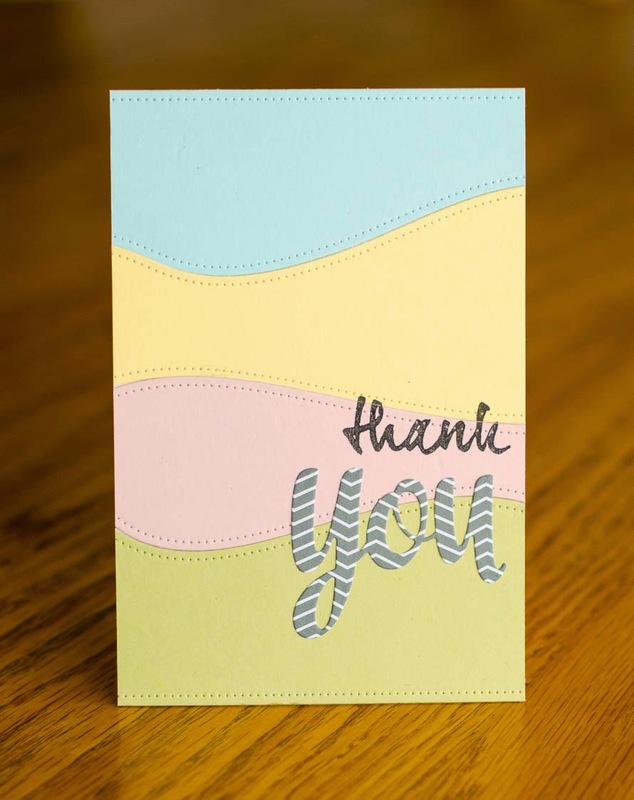 I love the way she used our Everyday Collection patterned paper to accent the sentiment. The little chevron from our Chevron Bits die set is too cute as well! 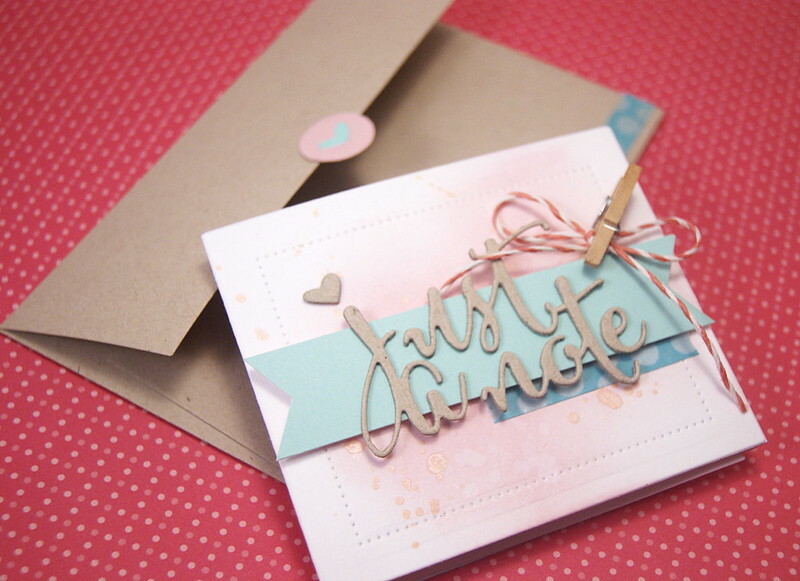 Yainea created this adorable gift card holder using our Just A Note and Dotted Borders Die sets. I just adore this! 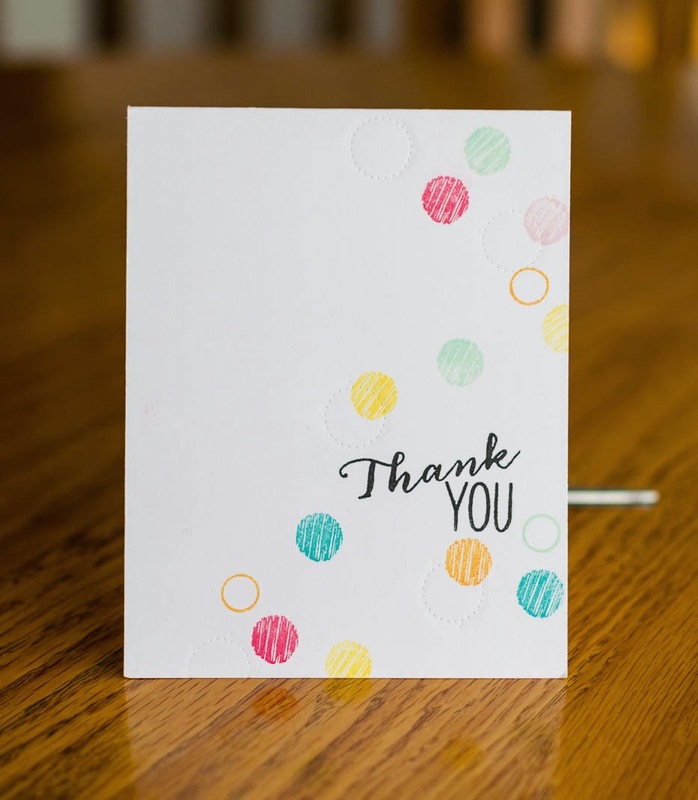 The sentiment from our Many Thanks stamp set looks great stamped in gold on the inside! Be sure to check out Yainea's blog for more details! Happy Friday! I hope that you had a fabulous week! I have two cards to share with you today. Katie Gehring created this first card using our You're Invited Stamps and Dies and our Weather It Stamp Set. 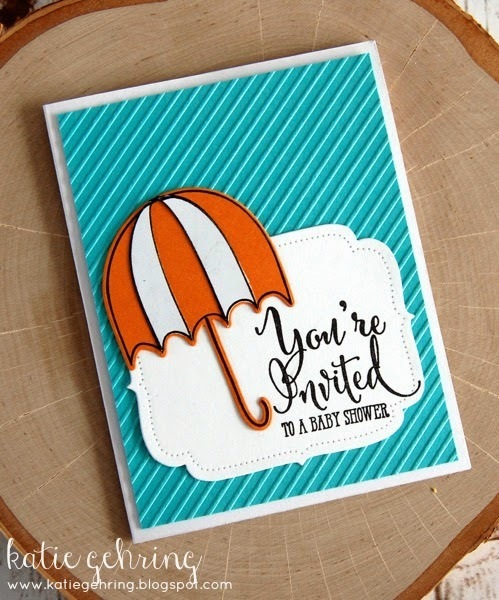 I love the way she used the umbrella to create a baby shower invitation. 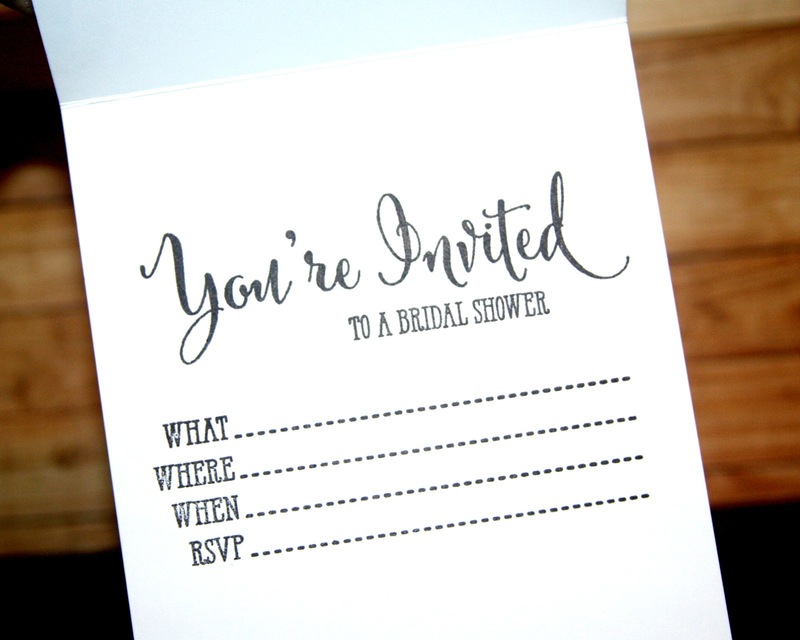 I can see this working for a bridal shower as well. I just love it! 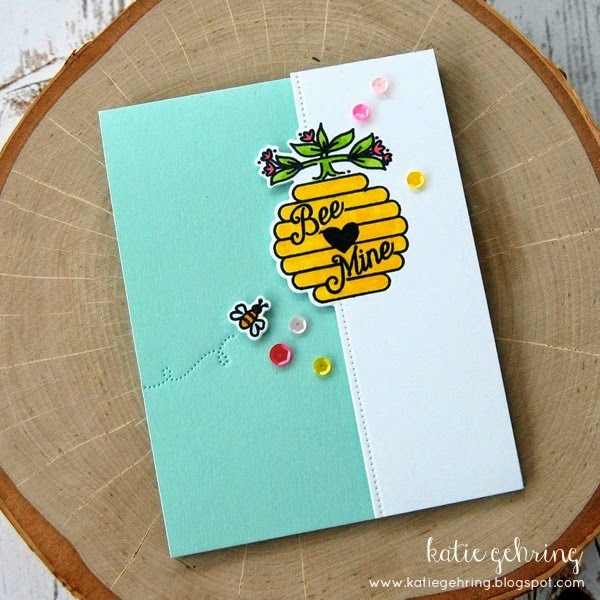 Karolyn Loncon created this next card using our Elle's Alphas stamps, Bee Mine stamp set and Gift Tags die. 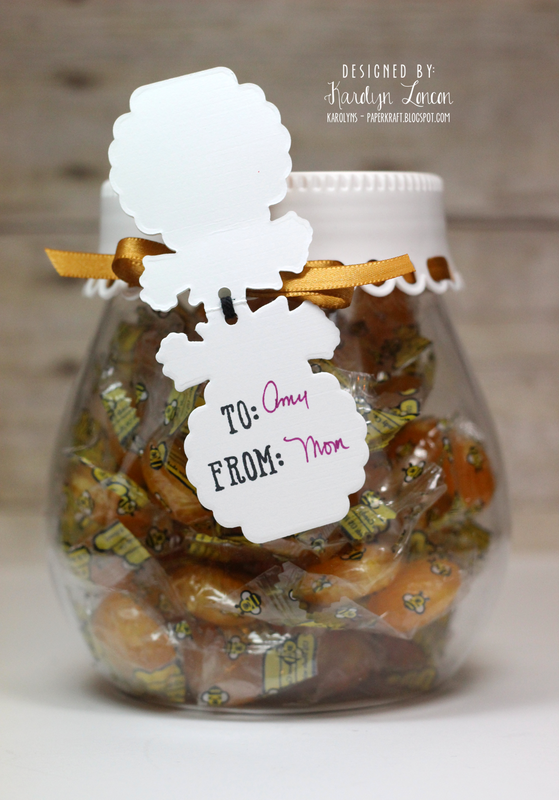 I love the honeycomb background she created! This is just adorable! I have three amazing cards to share with you today. 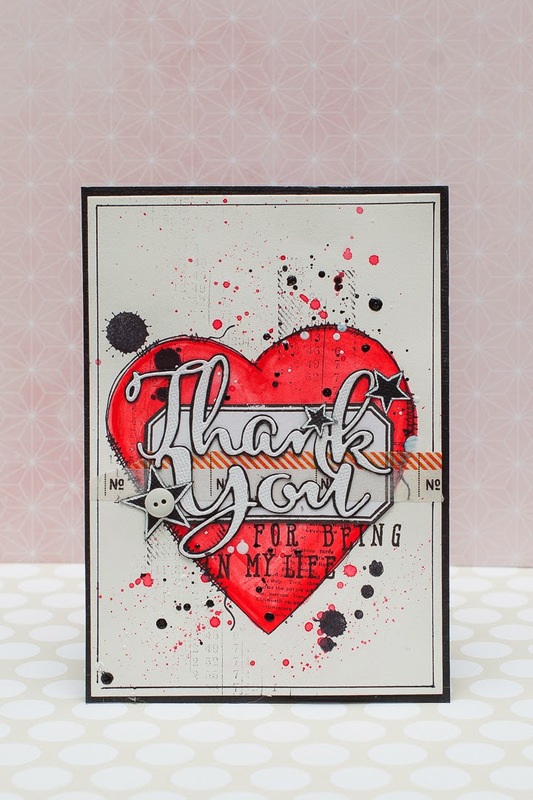 Heather created this first card using our Thank You Die and Simply Said Love stamps. I love the way that they look together on the mat from our Dotted Dies. Just Gorgeous! 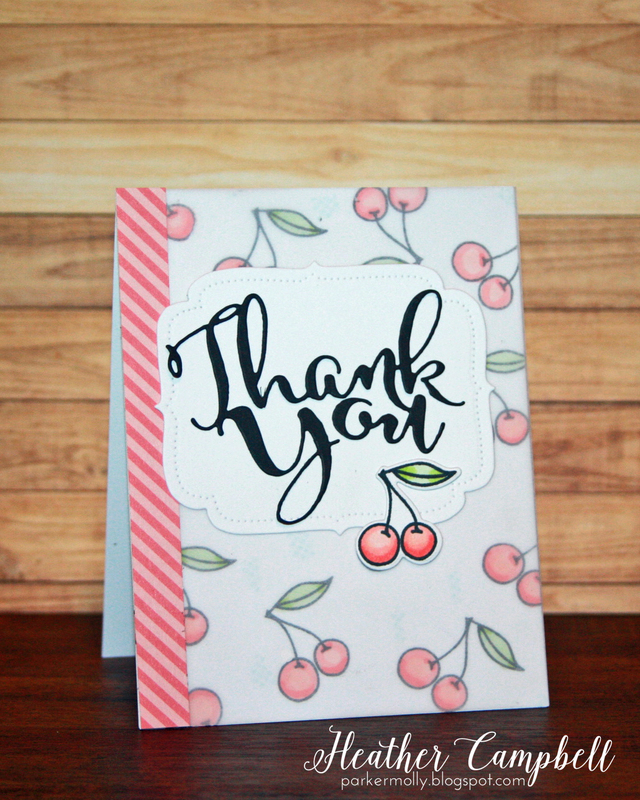 Heather created this next card using our Thank You die but she matted it on our You're Invited die cut and stamped cherries from our Berry Good stamp set on the background. So cute! 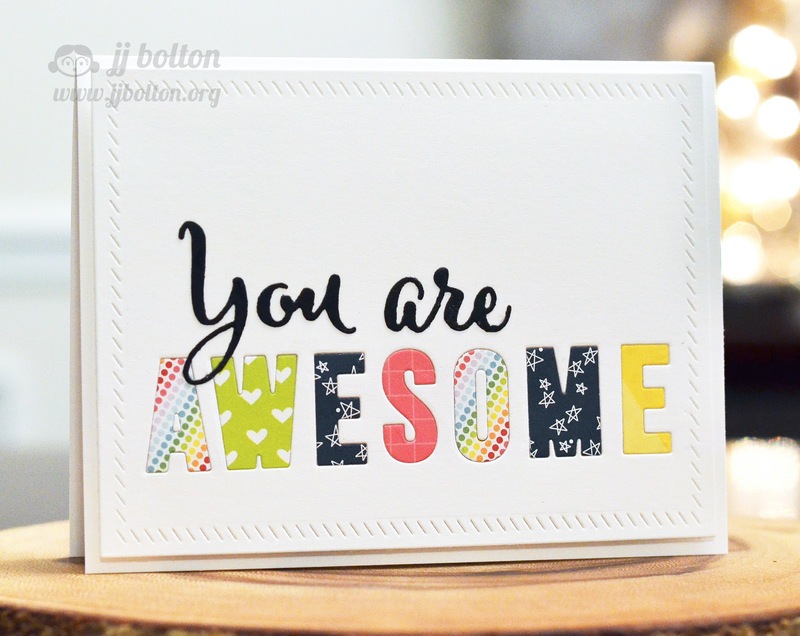 JJ Bolton used part of the sentiment from our You're Invited Die and paired it with die cuts from our Avery's Alphas die set using our Everyday Collection and Brights Collection paper. She mounted everything on a Finished Frames mat. I love it! Hello and happy Wednesday. I have a fantastic layout to share with you today. Maska used our Bunting and Dotted Borders dies along with sentiments from our Aim High, Simply Said Hello and We R Family stamps to created this gorgeous page. I just adore the colors! Today I have this adorable card by Chunyuan Wu to share with you. She used the script sentiment from our Just A Note Die, patterned papers from our Everyday Collection and our Aim High dies to create this first card. I just love that gorgeous sentiment! 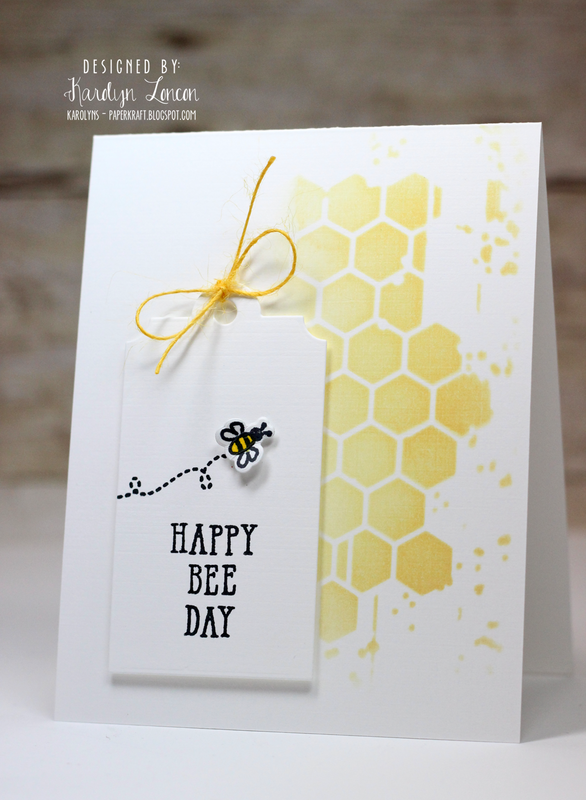 Melania Deasy used our Bee Mine stamp set and Finished Frames dies on this next card. I adore the beautiful and artsy look! Today is our last day at CHA and I wanted to take a quick minute to thank everyone that I met that stopped by our booth. It has been so fun to meet all of you from all over the world! Thanks for stopping by to take a peek. Have a great day! Hello! I am popping in quickly today to share these two amazing cards. Caryn Davies created this first card using our Made With Love stamp set and patterned paper from our Brights Collection paper pad. I just love it! Yainea created this card using our Simply Said You stamp and dies and our Bunting stamps. Isn't it just the cutest? !